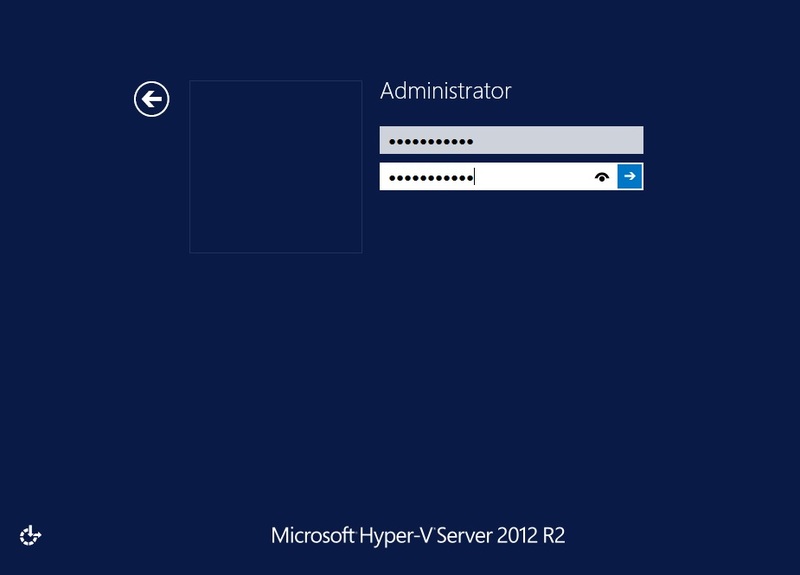 What’s involved in building a Hyper-V virtual environment? First and foremost, you need a reliable and efficient Hyper-V host on which your guest VMs will run. In today’s blog post, we are going to discuss whether Hyper-V Core 2012 R2 should be used as a Hyper-V host and which steps are included in the Hyper-V Core installation process. Hyper-V Core can be used for running Linux VMs which don’t require licensing. The computer running Hyper-V Core can be managed remotely using a GUI tool (e.g. Hyper-V Manager, Server Manager, System Center Virtual Machine Manager, etc.). Hyper-V failover clustering is supported. Hyper-V Core takes up less disk space and uses less memory than Windows Server. Hyper-V Core has a small footprint because only the core components are installed, meaning that less patching and servicing is required. Hyper-V Core has a small surface attack, meaning that it is less vulnerable than Windows Server. Hyper-V Core has a command line interface (CLI) only. 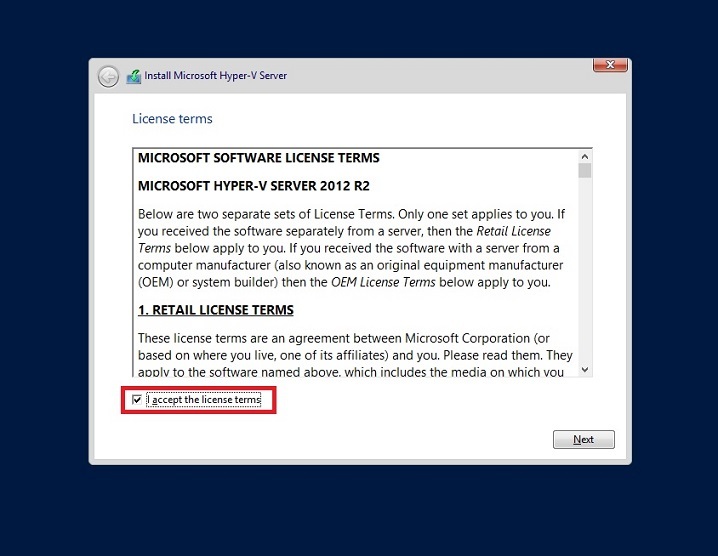 Even though Hyper-V Core doesn’t require any licensing, you must purchase separate licenses for guest VMs running Windows operating systems (OSes). Hyper-V Core provides limited software and hardware support. The use of other server roles is prohibited. Read further to learn more about Hyper-V Core installation, configuration options, and potential use cases. We are also going to describe how NAKIVO’s Hyper-V Backup and Hyper-V Replication can help you protect your Hyper-V environment and simplify overall data protection management. 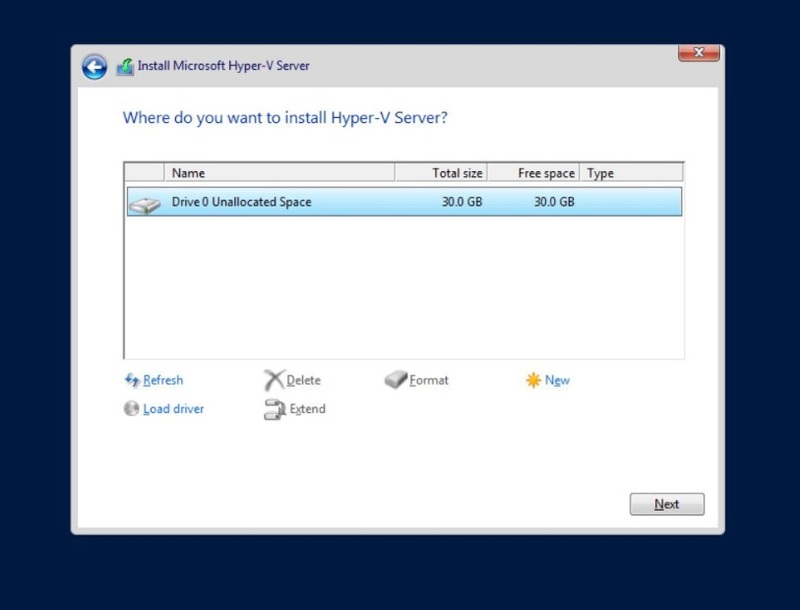 Hyper-V is a Microsoft hypervisor which allows you to create, configure, and delete virtual machines (VMs). 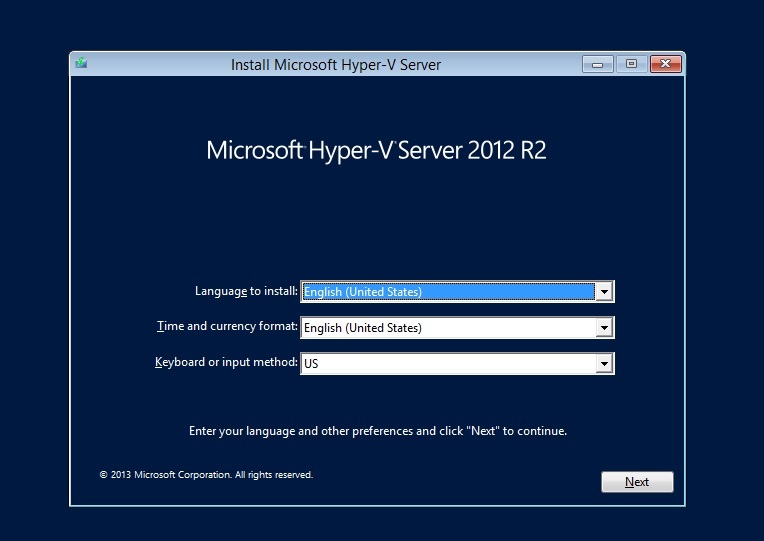 Hyper-V has been available as a free server role since the release of Windows Server 2008. Apart from the Hyper-V role, Microsoft has introduced Hyper-V Core (also known as Hyper-V Server) as a standalone product which contains only the Windows hypervisor, a Windows Server driver model, and virtualization components. While Hyper-V Core does not feature various server roles and components which can be easily enabled in Windows Server, this is not of utmost importance as its main purpose is to enable server virtualization, consolidate various workloads, and reduce footprint and overhead costs. Before we can start Hyper-V Core installation, you first need to review Microsoft Hyper-V Core system requirements. If your computer doesn’t support these basic requirements, you will not be able to install Hyper-V Core correctly. Note that Hyper-V Core has hardware requirements that are similar to those needed for the Hyper-V role enabled in other editions of Windows Server. After checking for Hyper-V Server requirements, you can go to the Microsoft Evaluation Center, register, and download the installation file. 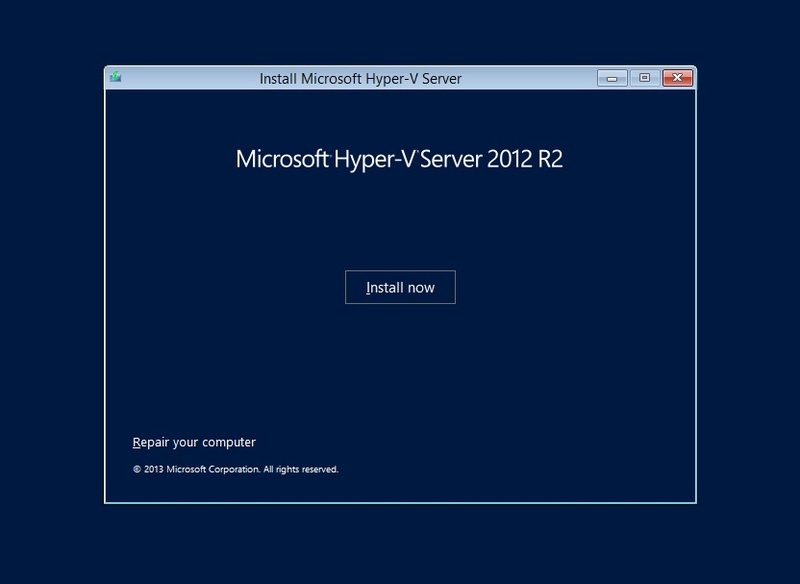 In this blog post, we are going to demonstrate how to install Hyper-V 2012 R2 Core. 1. Download the ISO file. 2. Burn the previously-downloaded ISO file to a DVD or USB and boot from it. 3. Select Language, Time and currency format, and Keyboard or input method. 6. Select the type of installation you need. For a clean installation, click Custom: Install the newer version of Hyper-V only (advanced). 7. 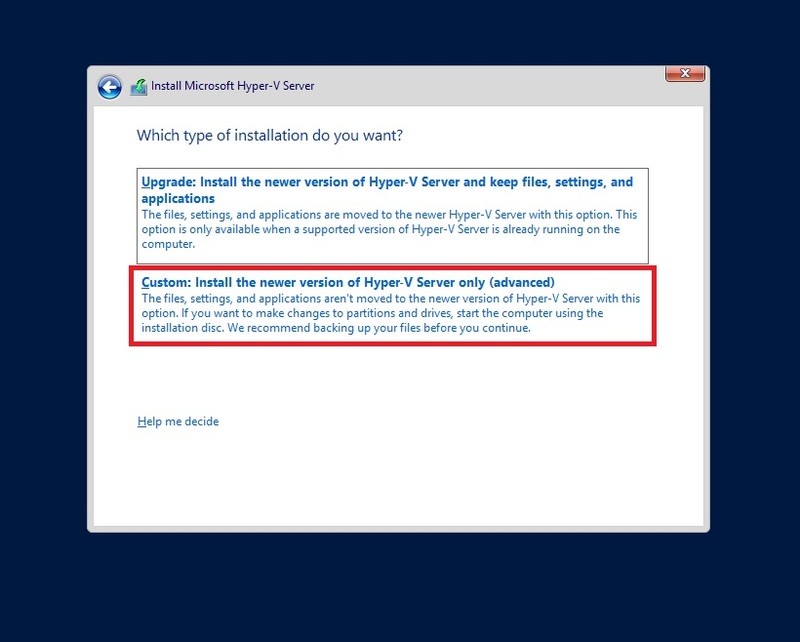 Choose the disk where Hyper-V Server needs to be installed. 8. Hyper-V Core installation will start, during which the computer will restart several times. 9. After the system reboot, you will be asked to enter a new user’s password and confirm it before signing in. 10. Type and confirm the new password and press Enter. 11. Hyper-V Core is ready for use and doesn’t require any additional configurations. 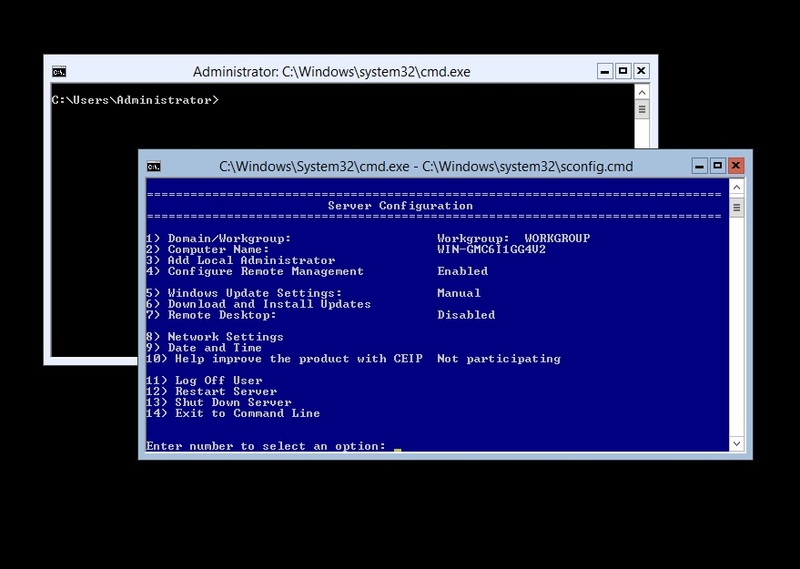 The Command Prompt as well as the Server Configuration tool (Sconfig.cmd) will automatically open. Most of these configuration options can be easily set if you follow the prompts. In our blog post, we wish to focus on how to configure some of these options. 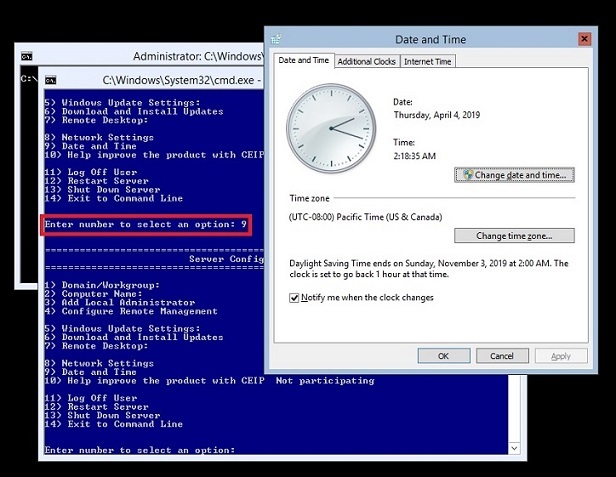 In the Sconfig menu, type 9 and press Enter, which will open the Date and Time wizard. Make the required changes. Enter 7 to select the Remote Desktop option. Here, you can either enable or disable remote desktop. Type E to enable Remote Desktop, then select the ‘Less Secure’ option, which allows connections from computers running any version of Remote Desktop. The option ‘Configure Remote Management’ is typically enabled by default. By selecting the option 4, the Remote Management menu will open. Here, you can either enable or disable Remote Management by selecting the corresponding number (1 or 2). However, server response to pings is not enabled by default. Thus, select the option 3 if you want to allow remote machines to ping this server. As the next step, you can create a new user account to join the local Administrators group. 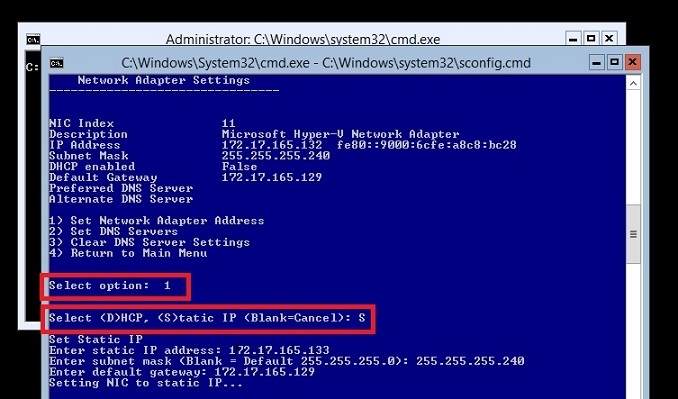 Note that the created username and password need to be the same as those of the account you are going to use on the client computer when managing Hyper-V Server remotely. In this case, select option 3 and specify the username. After that, you will be asked to create a password for this user and confirm the password by retyping it. The next step is extremely critical for enabling remote management of Hyper-V Core. For this purpose, select option 8, then choose the required network adapter from the list of available adapters (11 in our case), look through the network adapter characteristics, and choose option 1. After that, type S in order to set the static IP address. Next, you will be asked to type the static IP address, subnet mask, and default gateway. Moreover, you need to set DNS servers to ensure network connectivity. Select option 2 and enter the preferred and alternate DNS server addresses. Here you can use any DNS server you want. For example, you can apply freely available Google Public DNS addresses (8.8.8.8 and 8.8.4.4). Another configuration option is to change the computer name. For this purpose, select option 2 and enter the new computer name. After that, you will be asked to restart the computer in order to save the changes. 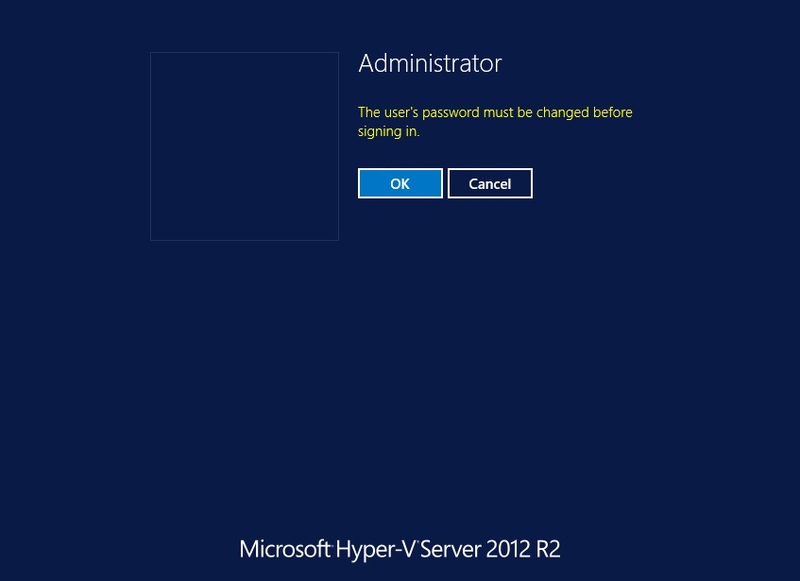 After the system has rebooted, you can connect to Hyper-V Core 2012 R2 from another computer using Hyper-V Manager or Server Manager and start managing the Hyper-V host remotely. Whether you are new to using a Hyper-V environment or have a lot of experience with it, you still need to ensure that your Hyper-V environment is securely protected. In this case, you must find an efficient data protection solution which can shield your virtual infrastructure from any unexpected disasters and minimize their possible repercussions. NAKIVO Backup & Replication is the solution which can provide you with multiple data protection options and even more unique features. NAKIVO Backup & Replication can protect your Hyper-V environment in a cost-effective and reliable manner, regardless of which Hyper-V deployment option is running in your environment. So, what exactly can NAKIVO Backup & Replication do? NAKIVO Backup & Replication allows you to perform agentless, application-aware, incremental Hyper-V VM backups. With this solution, you can also automatically create backup copies after every backup job and send those copies offsite. This way, you can eliminate a single point of failure and be certain that you have all of your critical data securely backed up in a remote location. NAKIVO Backup & Replication offers the utmost protection to Hyper-V environments using Hyper-V Replication. You can create and maintain exact copies of source Hyper-V VMs on a target host. In case of disaster recovery, you can easily fail over to those VM replicas and rapidly resume business operations without incurring significant losses. NAKIVO Backup & Replication enables simplified data protection management using Policy-Based Data Protection. You can set up policies which regularly scan your entire infrastructure and automatically add the VMs matching your policy rules to specific data protection jobs. This way, NAKIVO Backup & Replication lets you save time and minimize the risk of human error which is inevitable in manual VM management. NAKIVO Backup & Replication comes with a set of built-in features which work right out of the box. One of the most notable features is Site Recovery (SR), which allows you to automate and orchestrate the entire disaster recovery (DR) process from start to finish. You can create SR workflows by arranging various actions and conditions into an automated algorithm. Each SR job can be tailored in a specific way to address the DR scenario of your choice. Created SR jobs can then be tested either on demand or on schedule without disrupting the production environment. As a result, creating SR jobs can significantly improve your disaster recovery preparedness and minimize the impact of an unexpected disaster. Request a live demo by one of our engineers or download a full-featured free trial to test NAKIVO Backup & Replication in your virtual environment today and see for yourself the multiple benefits that the product provides.